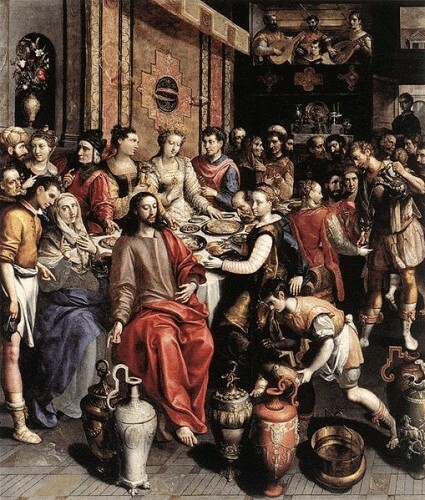 Jesus, his mother and his disciples had been invited to a marriage feast in the city of Cana. The Jewish wedding feast was a joyous occasion which took place after the wedding ceremony. And what a feast it was! It was the custom for the feast to last for seven days! Can you imagine how much food and drink it would take to feed guests for a week! They ran out of wine. Jesus' mother said to him, "They have no wine." She thought he should do something to help their hosts, but Jesus said his time "had not yet come", but she persisted and told the servants to do whatever Jesus said for them to do. There were 6 large waterpots there and each would hold about 18-27 gallons of water. That would be over a 100 gallons of water! Jesus told them to fill the pots up to the brim - completely full. After they had filled the pots, he told them to dip some out and take it to the person who was in charge of the feast. He tasted it and found that it was the best of wine. He wondered why they had saved the best until the last. Usually people would serve their best wine first and save the inferior wine to serve last. This was the first of Jesus' miracles. It showed his glory and caused his disciples to believe on him. When the alarm clock rings, turn it off. But be careful not to knock the clock into the tub of water beside the bed. WHAT! Why is a bathtub full of water beside my bed? "Well, I get thirsty at night - need water." One glass does not satisfy! So fill the bathtub and slide it in. Ring, Ring, Ring. Jump up, turn off that clock quick. "OOPs! I did knock it off into the water. My white slippers were under the clock. Now the 2 slippers for my feet are soaked. But look! They have turned red! Jesus did it again! Water to wine! Whaddayanobout dat! Let's have a party. We have plenty of refreshments." This zip code means the account is not found in Matthew, Mark, or Luke (000), but it is found in the 2nd chapter of John (2). Did the artist make the water pots a little small? This is the first miracle of our Lord. Shortly after He called his first disciples he told them they needed to go to Cana for a party. wasting time at a marriage. Perhaps they asked Him why they were going to a mere social party??? INVITED....let's take a little stroll over to Cana." Little did they know that Jesus was about to leave a little wedding present of the best wine they had ever tasted! Oh, was it good! They feasted for DAYS with the newly weds and left them enough to no doubt sell and pay for their honeymoon! Those 6 waterpots that once held water for ceremonial washings held about 40 to 40 gallons EACH! What a way to OPEN HIS MINISTRY! Read the rest of the story in John chapter 2.